Position changes from 5 ft. (1.5 m) away with a foot target/platform. Demonstrate sit and down positions from a distance of 5 ft. (1.5 m) using a foot target or platform. Purpose: Assess the dog’s ability to follow cues for the basic positions of sit and down from a stationary starting position. Equipment: Foot target for two front or two rear feet, or a platform/box/mat. Exercise set-up: Handler may either send the dog, or place the dog on a foot target or platform. The dog may start in any position (sit, down or stand). The exercise begins when the handler is facing the dog from 5 ft. (1.5 m) and cues the first position. From this distance, the dog must demonstrate a sit and a down position, in either order, with a single verbal and/or hand signal for each position. The handler must remain stationary at the stipulated distance. 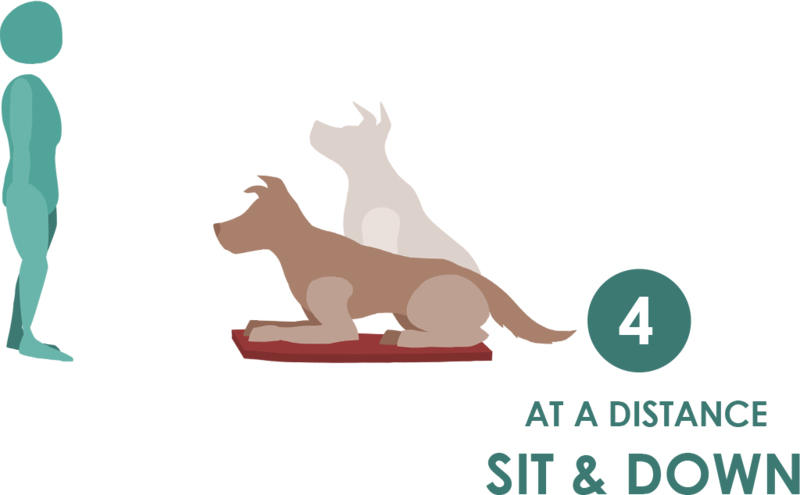 The dog’s starting position does not count, so if the dog started in a sit, the dog will need to show a down and then a sit, or vice-versa. The exercise ends when the dog demonstrates the second position. Non-qualifiers: Dog is unwilling to place two feet on a target, or four feet on the platform. Dog does not execute the correct first or second position on the handler’s cue. Dog requires more than one verbal/hand signal per position. Dog changes position before being cued to the second position. Excessively harsh cue. Handler moves before the exercise is completed. Dog moves forward with position changes (more than a 1/4 body length). Video does not permit the exercise to be adequately judged. Tip: If you use a signal, make sure it is a fluid motion and not held in the final position. Tip: Using a raised platform or box will make creeping much less likely than a low foot target, so consider this if your dog will potentially move more than 1/4 of a body length when performing positions, which will cause you to fail the exercise.